Corals/Plants: texas holey rock,rainbow rock and lava rock.some fake plants. 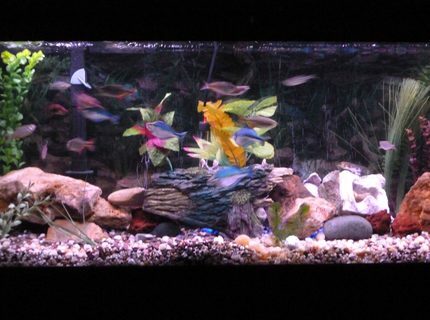 About Yourself: I've been keeping freshwater fish for for about 10 years. 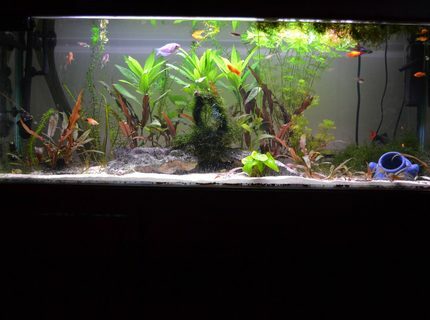 Im not interested in huge extravagant tanks, just simple and self sufficient environments. 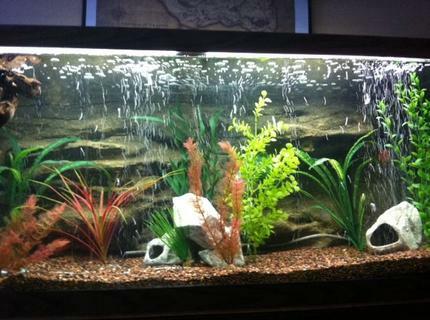 Cichlid's are my fish of choice and I have recently taken up freshwater plant keeping as a challenge. 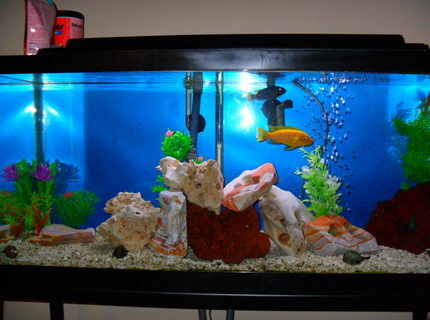 Fish Kept: 2 Firemouth Cichlid, Red Zebra Cichlid, OB Peacock Cichlid, Rubber Lip Pleco, Leopard Sailfin Pleco, 4 Nerite Snails. Corals/Plants: Anubias Nana, Cabomba, Ludwigia, Red Wendtii, Balansae, Marimo. Advice: Stay away from the chemicals! A stable environment is key, and there are many natural ways to accomplish this. Don't over stock and research your fish. 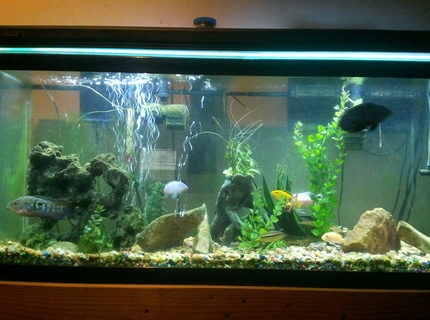 Fish Kept: Building our new salt-water tank next. 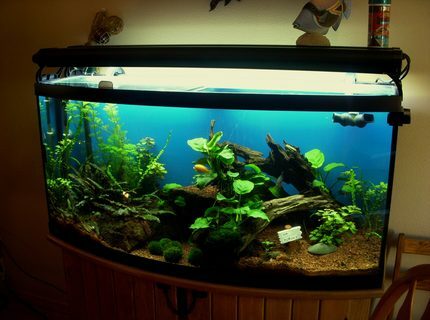 Advice: Take out 1/4 water weekly and add fresh water about the same temperature. Rinse filter pads. Add a dash of aquarium salt. Description: Fish paradise but still working on it. About Yourself: Been wanting a fish tank for several months. Advice: Research, research, research. 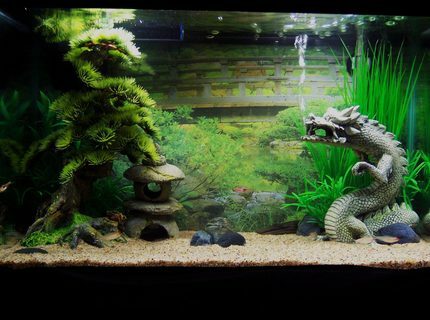 Allow at least 4 weeks for your tank to cycle. Or risk killing your fish. 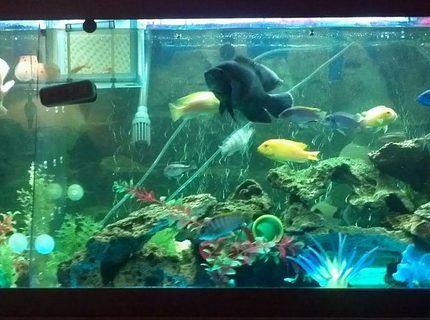 Fish Kept: 2 marbled veil angels, 2 black veil angles, 2 mixed veil angels, 3 Dojos, 1 Kuhli loach, 3 Clown loaches (1 5 inch, 2 inch and 1 inch, I had a breading pair of angels and the Male died because of old age and the female soon followed after his death. 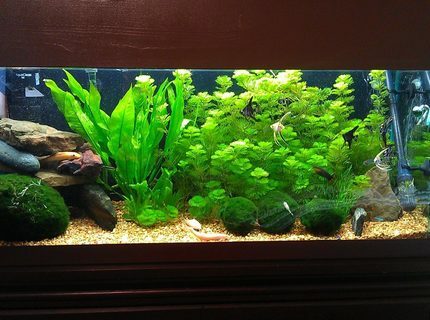 Corals/Plants: Plants= Cabomba, Amazon sword, Moss Balls. Advice: Trial and Error is the key to learning about the aquatic hobby. Corals/Plants: Live Rocks, Variety of fake plants. I place life plants here and there for the fish to feed on. Advice: save and get quality products. good cheap cannister filter is the sun sun wh302 on e-bay, every 6 months or so i clean it. Save for top shelf lighting. Description: see profile for specs. thank the old owners for the scratches caused by those stupid under gravel cleaners. About Yourself: Just a guy who likes fish. 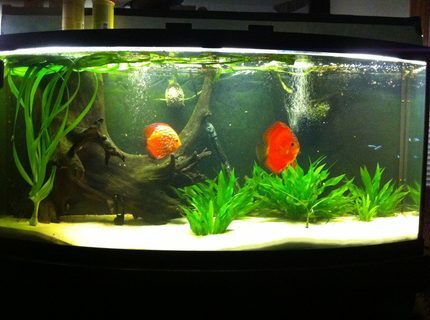 Fish Kept: Discus, cards, Cory cats, snails lots of snails! Advice: Dive in, just don't get swept away!